In an alarming revelation made during a Red Cross survey, over 50 per cent of school-going children in Jammu district have failed to meet the general health standards adopted across the world. A file photo of students coming out of a school. 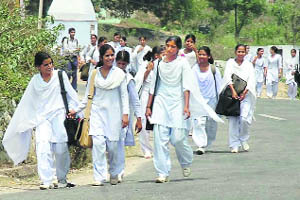 A Red Cross survey has painted a dismal picture of the average health of students in Jammu district. A minor boy was killed and his sister critically injured in a leopard attack at Darimal in Ghambir Mughala area of Rajouri district yesterday. With a majority of diagnostic and life support equipment lying defunct in state hospitals in the absence of adequate technical support, the government will soon set up separate bio-medical engineering departments to tide over the problem. Thousands of families in the Krishna Ghati sector along the LoC in Poonch district have been facing acute shortage of potable water as the dry spell has left the natural sources in the area dry. The garbage vans of the Jammu municipal corporation have become a source of nuisance for city residents, as these vehicles continue to collect garbage from the main roads and narrow lanes of the old city till afternoon. Nine persons were injured, four of them seriously, in a road mishap on the National Highway near Kathua today. Gareeb Dass, DIG, Doda, Kishtwar, Ramban range, along with Ramban SP Anil Magotra held high-level security review meeting at DPO, Ramban. All zonal and the divisional officers deployed for the Amarnath yatra attended the meeting. SSP Traffic (National Highway) Varinder Sharma, Commandant, IRP 9th Battalion, Varinder Bali and COs of 160 /84 Battalion, CRPF, also attended the meeting. Villagers blocked the Jammu-RS Pura highway for three hours today while protesting against the failure of the Power Development Department (PDD) in replacing the damaged transformers in the area and effecting unscheduled power cuts. The protest led to a huge traffic jam. The state unit of the Shiromani Akali Dal (Amritsar) today expressed shock and grief over the mysterious fire that destroyed one of the most revered shrines, Peer Dastageer Sahib, at Khanyar in Srinagar. A 10-day training programme in mouli-making organised by the SBI Rural Self Employment Training Institute, Reasi, in association with the BDO, Pouni, and Shri Gandhi Seva Sadan, Jammu, concluded at Pouni last evening. The Jammu and Kashmir Pradesh Youth Congress Committee (JKPYCC) today expressed grave concern over rising unemployment in the state, which in official record is around six lakh. The Hari Market Branch of the State Bank of India today organised a function to mark Bank’s Day at the Government Girls High School, Bhagwati Nagar in Jammu. Members of the National Panthers Students Union (NPSU) met with students of Government ITI College, Jammu, and asked them to fight for the rights of the people of Jammu against discrimination. The Jammu and Kashmir Democratic Front (JKDF) today organised a protest under the chairmanship of Anil Gupta at Gole Pully, Talab Tillo chowk, to highlight the demands of the unemployed youth. The Division Bench of Jammu and Kashmir High Court at Jammu, comprising Justice Varinder Singh and Justice Mohd Yaqoob Mir, has directed the Jammu municipal corporation to file a response into the construction of a hall in Green Belt Park, Gandhi Nagar, against the guidelines of the master plan of Jammu. The court has also ordered a status quo on the issue. A one-day convention of Congress party workers was held at Doda under the chairmanship of MLC Naresh Gupta, president, District Congress Committee Doda. The Rajouri district administration organised a ‘Run against drugs’ on the International Day Against Drug Abuse and Trafficking, in which people from the town, adjoining villages and government functionaries participated. Two persons got critically injured, when a shell exploded at Sandhi village , Kathua. The survey, conducted over a period of three years, was carried out in 2,659 educational institutions and anganwari centres covering nearly 2 lakh children in the age group of 3-10 years and the report has been submitted to the heath department. Around one lakh children have been found suffering from various minor ailments, including stress, due to the pressure of studies. Officials say while children in the rural areas are facing the problem of malnutrition, their counterparts in the urban centre are facing anemia or weak eyesight, but are better off than rural students in terms of overall health. Nearly 20,727 schoolchildren, after a general check-up by the Red Cross, have been referred to health institutions in past two years, while others have been given medical treatment during the survey. The survey in Jammu district has been conducted under a special project and the second phase of the study will include more districts, even those in the Kashmir valley. The survey carried out by the Red Cross along with the Health Department has revealed that most children in the rural areas and government schools are far less healthy than those studying in the urban areas and private schools. “In most cases, parents in the rural areas don’t take the health of their children seriously and rely more on alternative therapies when children fall sick. The data relates to Jammu and the situation in other districts can be worse,” says Suresh Sharma, district secretary, Jammu Red Cross Society. Sharma says the society in association with the health department is providing medical treatment to identified children because minor problems ignored at an early stage can become a major health concern later. A senior health official says the survey has given an accurate picture of the prevailing situation. A detailed project to provide comprehensive medical treatment to the targeted lot is being implemented. In the recent past, the state government has implemented several Central schemes targeting schoolchildren, but in most cases their success rate has been a matter of debate. The deceased, Irfan Khan, son of Javed Ahmed, along with his sister Afrat Begum were playing in the fields when the incident happened. The two were injured in the incident and were shifted to a nearby district hospital, where the boy succumbed to his injuries. The doctors referred the minor girl to the SMGS Hospital, Jammu, after her condition deteriorated. Minister of State for Forest, Power, CA&PD and Transport Shabir Ahmed Khan has expressed grief at the demise of a child in the incident. Expressing sympathies with the bereaved family, the minister said the government would provide an ex gratia of Rs 1 lakh to the next of kin of the deceased. He directed the wildlife authorities to ensure the completion of necessary formalities in this regard. He said Rs 30,000 would also be provided to the injured for treatment. The victim had been shifted to the SMGS for treatment and Rs 10,000 had been paid in advance to meet the expenses of her treatment, he added. Taking note of the incident, the minister directed the authorities concerned to minimise such attacks by keeping a vigil near forest habitations. He asked the field functionaries to keep a watch in their respective jurisdictions to evade such attacks. He added that any negligence on their part would be taken seriously. A bio-medical engineering department is proposed to be set up each at Government Medical College and Hospital, Jammu, and Government Medical College and Hospital, Srinagar. The Department of IT, Government of India, currently has two branches of DOACC in the state, one each in Jammu and Srinagar, which are the only existing repair centres for such equipment. Officials say in the recent years, the state has purchased a large number of sophisticated medical equipment, particularly diagnostic machines, but in the absence of requisite maintenance facilities, most are gathering dust. The problem is more pronounced in health centres at the district level, as they have to face a lot of problem if a fault arises in such machines. 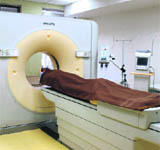 The machines sometimes remain out of order for weeks together in the absence of engineering staff, says a senior doctor. Of the 101 major equipment installed in different departments of the medical college in Jammu, nearly 95 are functional, while the rest need minor or major repairs, say officials. “Whenever any equipment develops a snag, we have to wait for days to get it fixed. At times, a minor fault puts the machine out of order for days,” says an official. The proposed super-speciality hospitals will have six specialities i.e. cardiology, cardio-thoracic surgery, urology, neurology, neurosurgery and nephrology. A number of imported equipment have been purchased and a well-trained team of engineers is required to keep these running. The households in the sector, with a population of over 15,000, having five big villages — Upper Ghani, Lower Ghani, Bhera, Dharati, Kuharian and Krishna Ghati Main — have to trek over 5 km to fetch drinking water every day. Some of the families have been forced to beg for water from Army vehicles that pass through the area. An area of 15 km has limited sources of water, which go dry during this part every year. As a result, villagers have to tread 5 km to fetch water every day. The villagers allege that despite having made several representations to elected representatives, PHE officers, tehsil and district administration, no one has so far come forward to help them. They claim that the area is without potable water supply and people have been facing a lot of hardships on this account. Hot weather conditions have added to their misery. “We have been facing hardships for over 60 years. We have been hearing about lift irrigation schemes for long but nothing has materialised on the ground so far,” says 72-year-old Mohd Niaz, a local resident. “We have to trek 4 to 5 km to fetch water and also send one of our family members to the road to seek water from the passing Army vehicles. They sometimes provide us with water,” he adds. 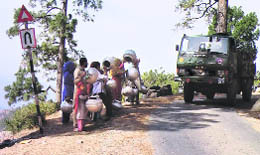 “Our family members, mostly children, carrying utensils keep a watch on the road to seek water from Army vehicles or a PHE tanker that visits the area once a week. They often return home empty-handed after a daylong wait,” says Fakkar Din, a local resident. “We often go without a bath for days due to non-availability of water. Water scarcity is the main cause of disease in the area,” says Noor Jahan, a resident of Ghani village. The area is rich in natural vegetation but due to non-availability of potable water, people do not keep cattle, says Ajeet Kumar Sahu, District Development Commissioner, Poonch. “The area is hilly and has very few natural sources of water. We keep sending water tankers to the area twice a week. We also send a water tanker under the Salani Water Supply Scheme once a week,” he said. “We have sent a proposal to the higher authorities under the NRWS Scheme, seeking a grant of Rs 1.7 lakh. Work under the scheme is expected to start in the next few months,” he added. 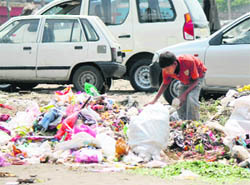 At times, residents have to face heaps of garbage on the road while going to offices, schools and colleges, as the municipal corporation workers arrive late to pick the garbage. Things get difficult when these vehicles block narrow lanes of the old city, leaving little space for vehicles to pass by. Sometime, these vehicles continue to collect the garbage till late in the afternoon, adding to the misery of the people. “MC vehicles are engaged in clearing some busy markets during the night. The garbage of the entire city cannot be picked during the night. Though we want the city to look clean in the morning, we can’t do much. It is impossible to engage labour, drivers and other requisite staff at night,” said an MC official. The police said a speeding car hit eight pedestrians this afternoon as Sanjeev Gupta, a resident of Lakhanpur, who was driving the car lost control of the vehicle. He also received injuries in the accident. Those who were hit by the car included Surjeet and Neelam of Bhagalpur; Neelam Kumari, Bhagvati, Shubh Prasad, two minors, including Kamlesh (4) and Pintoo (2), all residents of Langate, Morh. Another unidentified woman was also injured. The injured, including Kamlesh, Bhagwati, Pintoo and the unidentified woman, were admitted to the Government Medical College, Jammu, whereas the other injured were receiving treatment at the Government District Hospital, Kathua. A case under Sections 279 and 337, RPC, has been registered against the driver of the car at the Kathua police station. Gareeb Dass, DIG, Doda, Kishtwar, Ramban range, along with Ramban SP Anil Magotra held high-level security review meeting at DPO, Ramban. All zonal and the divisional officers deployed for the Amarnath yatra attended the meeting. SSP Traffic (National Highway) Varinder Sharma, Commandant, IRP 9th Battalion, Varinder Bali and COs of 160 /84 Battalion, CRPF, also attended the meeting. The DIG said all officers must put in their best efforts to extend all possible support to the Ramban Police for peaceful and smooth conduct of the yatra. He also inaugurated a yatra facilitation centre, constructed recently near Shan Palace, Ramban, for the facilitation of pilgrims. “Many pilgrims visited the Reception Centre and Police Control Room established there and appreciated the efforts of the police for providing the facilities,” he said. He visited the langer sites and security establishments in Ramban district up to Jawahar Tunnel and briefed the territorial officers to adopt proactive policing while dealing with the pilgrims. 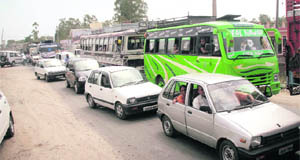 The movement of buses and trucks remained disrupted as the protesters, including women and children, squatted on the road and held a protest against the government and the Chief Minister. They alleged that the PDD staff had been ignoring their pleas for fixing faults in transformers and powerlines, which causing them a lot of problems. They got regular electricity supply for just four to five hours a day. They had to deal with fluctuations or long power cuts, which made their lives miserable, they claimed. The protesters alleged that they had approached ministers and senior officers of the PDD numerous times but nothing had been done to mitigate their problems. “We have approached the officials several times, but they have not paid any attention to our problems. They have only given us assurances so far,” said Manjeet Singh, a local resident. He said nothing had been to replace old transformers in their area. “We are law-abiding citizens, but the administration is provoking us to take law into our own hands. We want regular power supply, but officials have been unnecessarily harassing us,” said Lovely, a resident. A PDD official said illegal connections and use of heavy electrical appliances were the root cause of the problem. “The transformers installed in the area can take a certain amount of load, but many people are using illegal methods to draw electricity. This is causing the problem,” the official said. While expressing solidarity and sympathy with the Muslim community, SAD (A) leader Simranjit Singh Mann appealed to the Muslims to bear the ordeal, even if it was part of a conspiracy and maintain communal harmony. In a press note, the party hoped that all communities would join hands and rebuild the historic shrine in a more befitting manner. Around 40 women learned the skills of making mouli, which will help them gain employment. At the Valedictory function, Mohd Lateef, project officer, District Rural Development Agency, Reasi, distributed certificates amongst the trainees. Lateef said he was grateful to the bank for imparting training to the women on their doorstep. Emphasising the need for taking up constructive economic activities for the youth, he said proper intitiatives would be taken to eradicate the menace of unemployment. The training was arranged at the demand of the local population, particularly women of the area. RL Lochan, LDM, SBI, said the youth must come forward to avail the benefits provided by the bank and make their lives meaningful by setting up income generating self-employment units. Sandeep Singh, secretary, Gandhi Seva Sadan, Jammu, said they would provide support to the trainees to market their products. SK Kandroo, director of the institute, said the bank had demonstrated its concern for the unemployed rural youth. He thanked Lateef and Sandeep for being instrumental in making the programme successful. He also thanked Suhail Ahmed, BDO, Pouni, and his team for providing the requisite infrastructure for the training programme. DK Khajuria, BM, SBI, Pouni, was also present. NABARD and DRDA had partially financed the training programme. The PYC Vice President (Lok Sabha), Varun Singla said that rising number of unemployed youth in Jammu and Kashmir should be the cause of worry and concern for the coalition government. He said that educated, uneducated, skilled and unskilled youths are looking for jobs but they don’t have sufficient avenues as there is no healthy private sector in the state. The government had been advertising for vacant posts in all the government departments but those are not sufficient enough to cater to the needs of rising unemployed youths in the state, he said. He urged the youths to look beyond government jobs and hoped that government will do it’s best to encourage private entrepreneurs, so that they can create more jobs. Singla said that despite the fact that Mahatama Gandhi National Rural Employment Guarantee Act (MGNREGA) scheme guarantees one hundred days of employment to adult members of a family willing to do public work-related unskilled manual work at the statutory minimum wage, youths are still rushing towards cities for jobs. He said that there are many destinations which are still untapped and efforts should be made to create enough infrastructures including roads, tourist huts, restaurants, recreational parks, lakes and trekking routes so that jobs are created for the youths. The branch handed over ceiling fans to the school authorities as infrastructural support for welfare of the students. Rama Kumari, Principal of the school praised the initiative taken by the management of the bank. The Assistant General Manger of the Branch, SP Gupta said that their organistaion works the society occasionally. “The SBI was awarded the prestigious Golden Peacock Award for CSR 2012, as it performed outstanding work in the field of corporate social responsibility. The Credit for the same goes to all our branches and circles across the country. Such efforts have brought smiles to millions of school children,” Gupta said. Prominent persons who graced the occasion included Ram Raj Sharma, Nidhi Anand, Nirmal Dhar and VK Parimoo. Students of ITI College discussed the issues regarding summer vacation, drinking water and electricity with the NPSU members. Pushvinder Singh Manhas, in charge, NPSU, said they had been fighting for the rights and justice of the students for many years. He said the NPSU would continue to fight for the rights of the Jammu region. He further appealed to the students of the college to join the union to make the voice of the students stronger. Hundreds of workers took part in the demonstration. The protest was led by Rohit Kerni¸ district general secretary, Sukhpreet Singh, district secretary, and Vikrant Sharma, treasurer of the front. The protesters burnt the effigy of the state government to express their anger against growing unemployment among the youth of state and the non-serious attitude of government in formulating concrete policies to end the problem. “The discriminative attitude of the state government will be resisted collectively. We cannot remain a mute spectator to the discrimination. We demand an unemployment allowance of Rs 2,000 per month for the youth till they get jobs,” said Rohit Kerni. In a public interest litigation filed by Raj Gopal Sharma, the petitioner had submitted that the Director, Floriculture, had recently started raising a structure in a prominent area of Green Belt Park in violation of the Master Plan for Jammu, 2021. The writ petitioner had sought directions to the Commissioner and Secretary, Agriculture Department, and Director, Floriculture, against raising the hall, measuring over 62 sq m in the Green Belt Park area, and further sought the demolition of the structure constructed illegally by the Floriculture Department. Abdul Majid Wani, MLA Doda, and G M Saruri, MLA Inderwal, addressed party workers, panches and sarpanches on the occasion. MLA Doda highlighted the achievements of the coalition government in the state during last few years. Various speakers expressed their anguish over non-representation of the erstwhile Doda district in the state cabinet. They had their reservations for few important portfolios of congress party quota being presently held by the Chief Minister. “The common masses face problems in highlighting their serious issues in the state cabinet meetings. A wave of resentment and anger is brewing among the people for unfair treatment given to them by not including any congress party MLA from Doda region in the state cabinet,” said the speakers. The 3 km-run started from Alpha Gate near Army Hospital was flagged off by the DC, Rajouri, Saugat Biswas and concluded at Dak Bungalow. The District Youth Services, Sports office and Health department organised refreshment and technical support for the run. Among the boys Sultan Nawaz got the first prize, Arun Kumar the second and Gourav Sharma clinched the third prize while Bharti Sharma, Shazia Mir and Rahila Hasan got the first, second and third prizes among the girls respectively. The Commissioner said, “The district administration through its various departments will organise awareness programmes like seminars and street theatres. The forest department will work in the direction of removing cannabis from the forest as well as inhabited areas during the period”. The accident occurred today afternoon when two persons, Darshan kumar (27) and Ram Dutt (30), both residents of Ghagwal were loading stones in a tractor near the nallah.